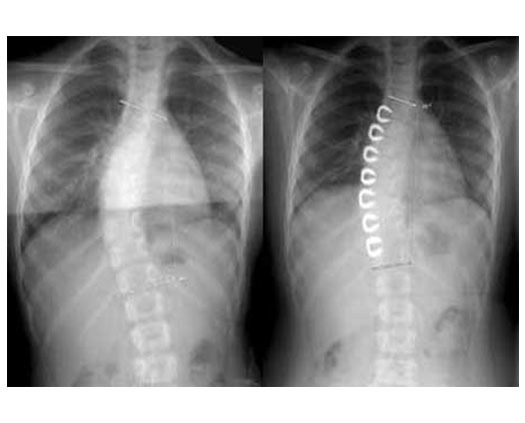 Vertebral Body Tethering (VBT) is a fusionless treatment for scoliosis. This method uses growth modulation, which partially restrains one side of the spine in order to allow the other side to grow. Eventually, this will reverse the abnormal growth pattern causing the scoliosis. 2. Why haven’t I heard of this approach before? Spinal tethering is not a new procedure, and has been around for many years. The traditional use for this treatment is as a dynamic stabilizer in the lower spine. However, physicians across the country are gradually adopting spinal tethering in order treat scoliosis as a dynamic stabilizer in the growing anterior thoracic, or upper, spine. 3. How does this treatment work to correct scoliosis? Titanium screws are placed on the outside, or convex side, of the vertebra, which is the area that is growing faster and causing the scoliosis. A flexible spinal tether is attached to the screws. When tightened, this tether compresses the adjacent screws in order to help straighten the spine. Immediately after surgery, you can already see a difference in the spine, which will only continue to improve over time. 4. What is the main benefit of choosing this method over the others? Compared to traditional forms of treatment for scoliosis, such as bracing and spinal fusion, VBT is fusion-less and allows you to retain your mobility. With bracing, your mobility is extremely restricted, making it very difficult to maintain your same level of activity. With spinal fusion, it is a much more invasive procedure that also entails a lengthy recovery process and heavy restriction of activities. Most activities, such as sports and swimming, are off limits after a spinal fusion, anywhere from 3 months to an entire year. VBT allows the spine to continue growing in order to correct the curvature in a less invasive way. The other main benefit of choosing VBT is that it promises spontaneous or even complete correction of the spine as the child grows, as long as there is enough growth remaining. These are results you most likely will not find with traditional treatments of scoliosis. 5. Who should be considered for VBT? The best candidates for VBT are adolescents or juveniles over the age of 10 with Idiopathic scoliosis who still have significant growth remaining. The thoracic curve should ideally be anywhere between 30 to 60 degrees. Do you have more questions about VBT and how it can improve your child’s quality of life? Contact Dr. Baynham today.